Many individuals would love to train with me in person but they don’t live in my vicinity. 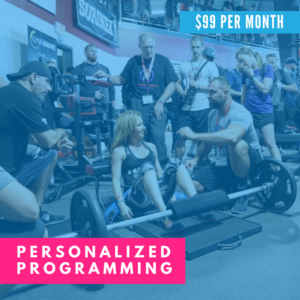 For this reason, I created Strong by Bret so that people can train using the exact same program I use with my real clients. Each month, I create a new training program consisting of 3 full body workouts for my clients. I also include optional full body training programs for people who wish to train more frequently, in addition to creative 10-minute glute blasting circuits to perform throughout the week. Subscribers to Strong by Bret can join my inner circle and receive forum access where they can ask me questions, submit videos of their form for feedback, and be a part of the Strong by Bret community. I wrote this eBook in 2009. Though I’m much more knowledgeable now and a much greater scientist, I’m still very proud of this eBook. The terminology and concepts I coined, including load vector training, as well as the glute exercise categorization system is top notch information. Furthermore, the EMG experiments contained within are very comprehensive and insightful. 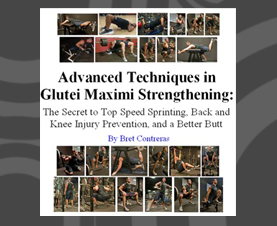 You’ll never run out of exercise ideas as the book includes hundreds of pictures of glute exercise variations. 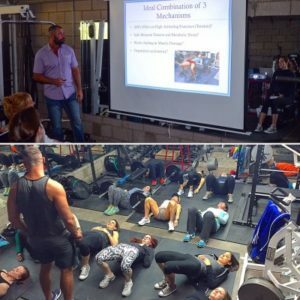 If you have ever dreamed of training with the Glute Guy then do not miss this exclusive opportunity to sign up for 100% personalized programming by Bret Contreras, PhD, CSCS, and personal trainer for 20 years. 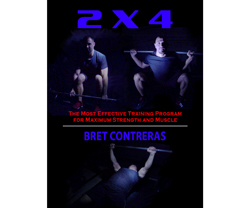 Whether your goal is to build an incredible stage-worthy physique, increase your overall athletic strength and power, or you simply want to focus on the very best glute strengthening workouts, Personalized Programming with Bret Contreras will provide you with highly effective monthly workouts custom tailored for YOU and YOUR goals. Please note: this product provides custom programming only and is not 1:1 coaching. 2 x 4 helped me finally deadlift 600 lbs and reach the 300/400/600 bench/squat/deadlift club, and it helped several of my colleagues reach new levels of strength development as well. Strong Curves is my Magnum Opus that contains all of my secrets, wisdom, methods, rationale, and programming pertaining to glute development. In mid 2011 I asked my colleague Kellie Davis to collaborate with me on a project. What started out as a simple eBook transformed into a 300-page published masterpiece. 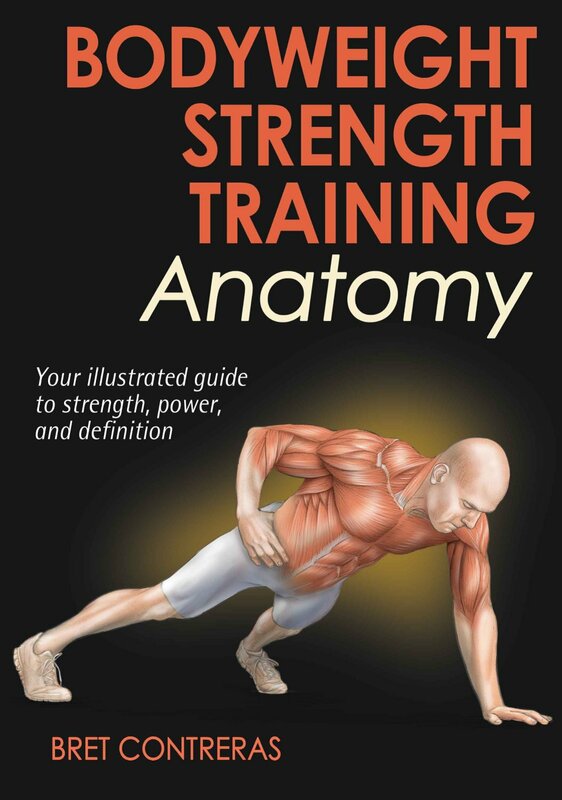 Bodyweight Strength Training Anatomy is an illustrated book with over 150 exercise descriptions (and pictures) and a chapter that teaches you how to write your own bodyweight strength training programs. I was sure to include all the basic movements along with unique and advanced movements to keep you challenged. 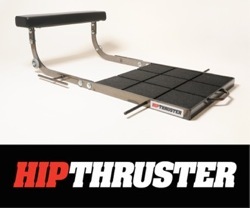 It’s taken me a long time to develop The Hip Thruster, and I’m finally confident that I’ve created the perfect model. 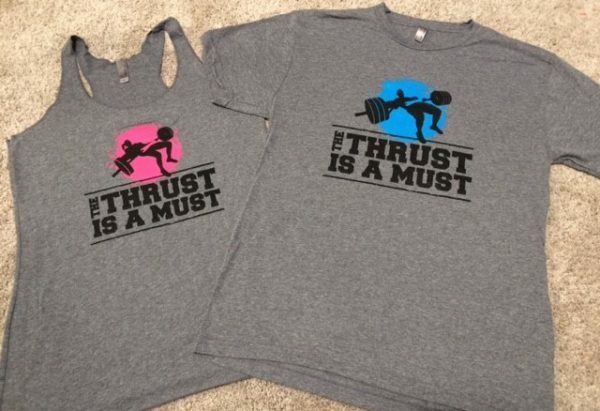 The Hip Thruster allows you to perform barbell hip thrusts, band hip thrusts, and barbell plus band hip thrusts so you can maximize your glute-shaping success. Cost in the USA is $499 plus shipping. Cost in Europe is £499 plus shipping. 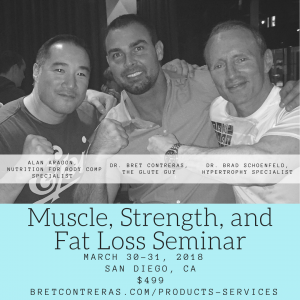 Get ready to get your science on and reserve your seat now for this special two-day engagement in San Diego, California with Bret Contreras, Alan Aragon, and Brad Schoenfeld at the Glute Lab! If you want to hear about cutting edge glute research, learn how to design good glute training programs, be instructed on a huge variety of lifts, and learn how your anatomy/anthropometry impacts your mechanics, then this seminar is for you. Beginners and professionals alike will no doubt benefit from this event. –Cost is $399 to reserve a seat/attend. Sign up for Bret’s newsletter to be notified first of upcoming Glute Guy events! Get ready to get your science on and reserve your seat now for this special 1-day engagement at Northington Fitness and Nutrition in Gilbert, Arizona (Phoenix area). Earn .9 NSCA credits for attending this seminar!